It is with immense joy that we announce that, as of 9th May, 2015, West African nation Liberia has been declared free of Ebola virus transmission by the WHO. In a statement released the very same day, the WHO explained that it had been 42 days (twice the disease’s incubation period) since the last confirmed case of the disease was buried; and gave detailed credit to all the parties, and factors, that made this success possible. What makes this even more significant is that, of the three suffering countries, Liberia was the one that contributed the maximum deaths to the outbreak’s overall toll of 11,000 (confirmed). A precious minority in the mainstream media have given this event attention; or written about the heroic efforts of the medical workers who have defeated the disease. The disease is still doing damage in Sierra Leone and Guinea; but those 2 countries should be free of the curse soon too – perhaps as early as next month, we hope. Since Ebola became “boring” in about mid-September, you can use this article we wrote in early October to refresh your memory. It was written at the time when the outbreak was at its peak: almost 300-400 new cases were being reported every week in Liberia. Since then, although a shocking 6000 people more have died, the situation has been steadily improving – that number gradually decreasing with every passing week: falling first and most rapidly in the worst hit Liberia, and then more slowly in Sierra Leone. The final tally of 27,000 confirmed cases is actually a relief compared to the worst case scenarios of over a million cases predicted by the CDC. The disease also migrated to no new nations, apart from a scare in bordering Mali that was kept down to just 14 cases. Although none of the vaccines that were being tested through the final months of last year were ready in time to make any sort of difference; November & December saw the usage of blood plasma from survivors to excellent effect. By December, the disease had been curbed to such an extent that the CDC revised their predictions: their new forecast of 50,000 closer to (but still much higher than) the eventual reality. The awful memories of the diseased being turned away from treatment centres having no beds or space to die in the open and spread the infection in September transformed into happy images of unused beds and extra doctors in January. In 2015, Sierra Leone has been the main site of new cases: but there too, the past few weeks have been some of the best. In the celebration, credit must be given where it belongs: to the health workers that won this war. A new problem of a destroyed health apparatus as a result of Ebola’s chaos has arisen; and medical workers stay back to re-equip clinics and, deal with and provide immunization for malaria, tuberculosis and other diseases that have returned with a vengeance. Time magazine must be applauded here; while media attention to this awful epidemic had all but died back in October, it (unpopularly) named Ebola fighters its Persons of The Year 2014 in December. The “fighters” are not the government officials, the military, other governments’ workers or WHO officials: these are independent voluntary health workers, who were the first responders to the outbreak. For a long time, it was just these workers: doctors, NGO workers and all sorts of volunteers in Guinea, Sierra Leone and Liberia, and non-governmental international aid workers and doctors from the US, UK, Europe, etc. who volunteered; who were fighting the war on Ebola. Volunteers from Medecins Sans Frontieres (aka MSF or Doctors Without Borders), the Red Cross, religious humanitarian organizations, and other welfare groups in the region did the awful work that was the only line of defence at the time: sterilely taking dead bodies away from loved ones, putting the infected in isolation to die – trying to convince the resistant communities that they were there to help. Eternal Love Winning Africa, ELWA, is a missionary organization whose centre in Liberia’s capital city became the first Ebola treatment centre: their contribution has been lauded by the Liberian government. For an outbreak that was identified in March, the WHO only made it an international health concern in August, and support and aid came from governments only in September; until then the MSF was providing the vast majority of isolation units and beds that were in short supply. In villages, towns, cities: the lack of a health infrastructure of any sort meant simple aid workers were given the task of dealing with a deadly epidemic. The image of this disaster: for those affected, and for the world, became one of spaceman-like figures clad completely in white (or blue, or yellow) full body suits that exposed not a centimeter of skin, wearing surgical masks and protection goggles, carrying away sick men, women and children, or their surgically wrapped dead bodies. It wasn’t easy being accepted by native, rural communities: the suits “scared people”, according to health worker and survivor Kent Brantly; villagers threw rocks at their cars, everything and everyone associated with Ebola was being attacked. But these heroes struggled on. Even though the government was ineffective in its assistance; even though the international response was “lethally inadequate”, according to the MSF president: sure they were expedite in creating airport checks and travel bans to prevent the disease from reaching their shores, but in helping the afflicted nations? Not even half the international aid that was promised came; and what came, came at its own pace – the first American funded Ebola treatment centre set up in November. Nothing deterred the fighters. 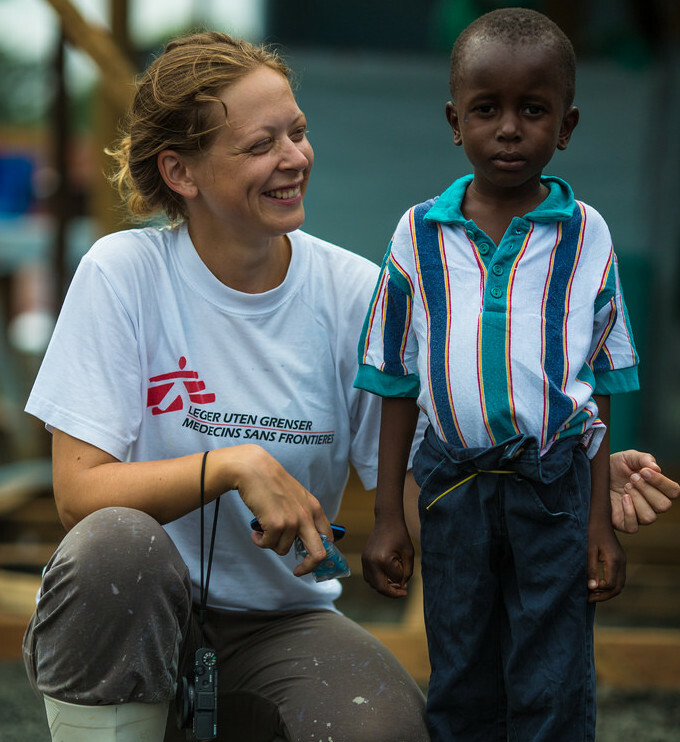 Salome Karwah was an MSF volunteer who survived Ebola, but watched her two parents die by its hand. She didn’t stop working; instead she continued with a renewed desire to make what difference she could. The job was one straight from hell: being hated by the people, at constant risk of infection to yourself, and the hopeless situation of treating patients who would die 90% of the time. In spite of the suits and the masks, the risk was supremely high: 868 health workers were infected themselves, 507 of those died. There still is no cure for Ebola: a few untested drugs never managed to reach the frontlines. Supportive care became the only thing doctors and medics could offer: rehydration fluids, general antibiotics and antimalarial drugs; and a bed to rest on. At least 50% of the time a patient would die, sometimes 75% of the time. So it is wonderful news, 7 months on, that Ebola has been eradicated from Liberia. But we failed the Liberians, Guineans and Sierra Leoneans. You and I. The world was tested for its response to epidemic: the scariest part is that we were not even given a difficult test, the world failed to prevent the spread of Ebola – a disease with an extremely low transmission rate. What if it were faced with a lethal influenza, or the plague? Health workers and the WHO remain cautious: because Ebola could resurface anytime, and this outbreak itself is not completely dead yet. The threat of epidemic remains always present; let us hope we respond a little better the next time. Please watch this video. And read the rest of TIME’s Person of The Year coverage here, and here.